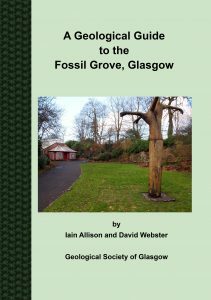 A new geological excursion guide to the Fossil Grove has been produced by David Webster and Iain Allison of the Geological Soceity of Glasgow. As well as describing the fossil trees in the building it includes several very interesting localities in the quarry area which is accessible even when the fossil house is closed. In the quarry a variety of interesting igneous and sedimentary features can be observed. The vegetation in the quarry area is currently being cleared and the rock faces cleaned so there’s no excuse for not visiting (and buying the guide! ).